Ensemble films represent an enormous opportunity to draw on diverse talent in filling a variety of roles and create a cohesive cinematic experience. This particular movie calls for an older British cast, which isn’t a problem for one nation that is filled with distinguished actors who have been working for many years. Director John Madden, whose token work is the Oscar-winning “Shakespeare in Love,” drafts two of his stars from that film, Judi Dench and Tom Wilkinson, as well as a handful of other extraordinary players for a wonderfully endearing and entertaining coming-of-age movie of a different generation. “The Best Exotic Marigold Hotel” refers to an alleged luxury resort in India which attracts a number of retired and disgruntled individuals looking for a new adventure in their older age. While their motivations for coming may not all be the same, no one expects the decrepit condition of the place, made up for only by the enthusiastic, untamable spirit of its new caretaker, Sonny, played by Dev Patel, in a return to India after his star-making role in “Slumdog Millionaire.” Sonny’s fervent efforts to save the hotel as his guests adjust their expectations is a marvelously amusing and enthralling ride. Though the film is an ensemble piece, it employs Dench’s Evelyn as the narrator, framing her as the central character. Both actress and character are perfect for the job, with the former having established an incredible resume as the go-to older English actress since her first (of six) Oscar nomination fifteen years ago, and the latter choosing her own path for the first time after the death of her husband. 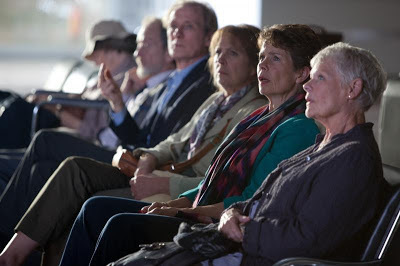 Dench is extremely likeable in the part, as she finds herself a job in India and befriends two of the men at the hotel, Wilkinson’s Graham, who grew up in India, and Bill Nighy’s Douglas, who relishes the opportunity to get out and see the culture despite his wife’s extreme fear of the unpredictable. Penelope Wilton is great as Douglas’ neurotic wife Jean, and Celia Imrie and Ronald Pickup are terrific as single Brits just looking for some companionship at their age. Unsurprisingly, the comedic standout is Maggie Smith, who fast-forwards in time from her Emmy-winning role on “Downton Abbey” but doesn’t lose any of her distaste for all things modern. Its ensemble is its greatest asset, but “The Best Exotic Marigold Hotel” also makes tremendous use of its setting, following each of its characters around as they delight in the singular wonders of India. The score, by veteran Thomas Newman, is an appropriate melody that underscores the culture, and, for the most part, defines the film as a good-natured comedy. 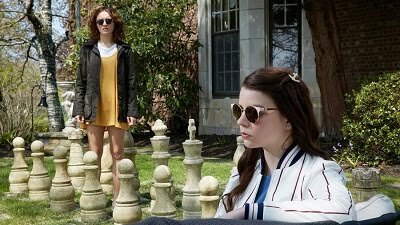 Several love stories amplify this film about friendship and self-discovery, which, thanks to superb players in front of the camera, proves entirely enjoyable.